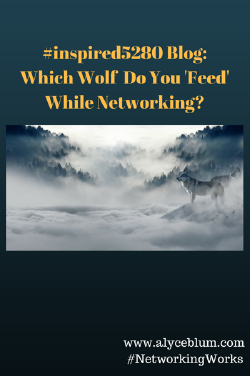 Which Wolf Do You 'Feed' While Networking? About three weeks I was on my yoga mat at 6:30 am (yes you read that correctly). I’m not great at a lot of physical stuff, but yoga is my jam. I’m particularly drawn to the studio where I practice (Kindness Yoga) and a few of the incredible teachers that make classes at 6:30 am an exciting time rather than one of dread. Ah, I love this story! What a simple, yet extremely powerful mirror for us all to consider when it comes to our personal and professional lives. Which wolf are we feeding on a daily, hourly or even moment-to-moment basis and how does that affect how people perceive us and how we perceive others? I’ve come to realize that for many of us our bad wolves tend to come alive when we start to think about networking. Whether you’re an avid networker or someone that’s just starting out on a networking journey, strategic and confident networking is no easy feat. For weeks I’ve been thinking about this story and the two wolves inside of me. I realized that my good wolf comes alive when ‘I feed it’ the following: yoga, time with family + friends, strategic planning around who and where I network, mental, physical and emotional breaks and of course lots of grace when it comes to various aspects of growing my business. What I mean by this is that something as simple as figuring what to put in the subject line of a follow-up email can ignite our bad wolf rather than our good wolf and feeding our bad wolf only creates blocks for our potential success. I hear various renditions of the following statement from my clients all the time, “I met with Susan weeks ago and never followed-up. Now, I just look bad and I’m sure she thinks less of me. It’s probably too late to send an email or call and what would I possibly even put in the subject line?” BOOM, enter the bad wolf. Rather than feeding our good wolf in a networking situation like this we all tend to default and feed our bad wolves. Perhaps, it’s habit, perhaps it’s uncomfortably comfortable, but whatever it is it's not helping us feel our best nor make strong connections. By simply being aware of which wolf we’re feeding we can be at the cause of our decisions rather than at the effect. Here’s another challenge I hear from clients all the time, “I get so nervous and in my own head before I walk into a networking room, how will I even start a conversation?” Again, we enter the bad wolf. Now, I’m not saying being nervous isn’t normal or totally ok, because it is, but when we feed our fears aka our bad wolf we tend to spiral into a negative place and it can be pretty challenging to come out of it. Taking a few seconds to calm your mind and feed your good wolf before walking into a networking event can result in endless opportunities for you and for those around you. Feeding our good wolves while we network doesn’t need to be complicated or overly action oriented. I believe it all starts with being intentional about our thoughts, feelings and of course our actions. Which wolf are you feeding when it comes to reaching for new goals, connecting with others and with yourself? We all have the ability to feed both our good and our evil wolves, but it’s up to us to stop, breath, consider and then act on which wolf we feed and thus what actions we take and what results we experience. I’d love to hear from you! How do you feed your good wolf when it comes time to network and how do you manage your bad wolf in times of stress and overwhelm? Share your thoughts by clicking here and I look forward to connecting with you soon!